Interkarma has asked me to write a quick overview about the upcoming modding feature that will be in version 0.3 that I’ve been working on. Currently mods need to be built into a Daggerfall Unity project to work, which is an obvious limitation. Interkarma has gone out of his way to support a bunch of different mods, even including them into Daggerfall Unity releases, but this takes up a lot of his time and has always been a temporary solution. The new modding system takes advantage of Unity’s asset bundles, and allows mod creators to export the assets that make up their mods (textures, models, c# scripts, prefabs and so on) from Unity to a single file which is then loaded at runtime. This means that going forward, modders will no longer have to rely on their mods being part of Daggerfall Unity to work. Modders will be able to create, share, and release updates for their mods all on their own. 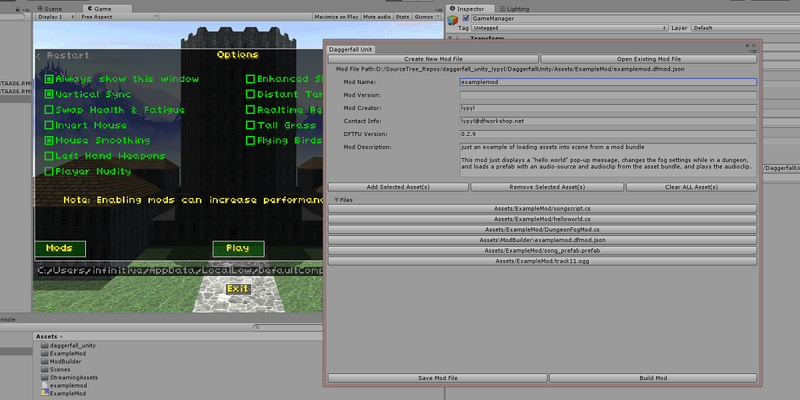 And using mods will require little more than the player placing the mod file in a directory. We’ll be providing more details on how it works, including examples and tutorials in the near future. Stay tuned! Posted in Daggerfall Tools for Unity, Daggerfall Unity.